No luck for me at my store today. 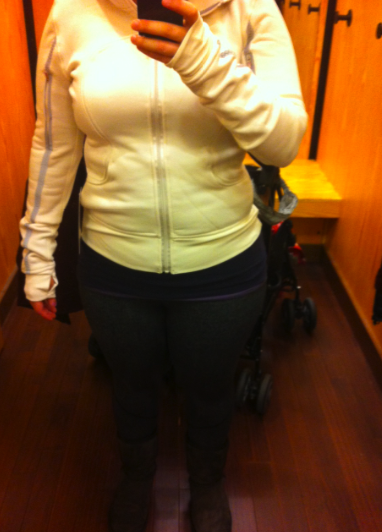 I went in hoping for Black Swan Wunder Unders and some sort of fall wrap but neither of those items are in/exist yet. The Uba Hoodie was a huge disappointment for me. I’m quite frankly shocked at the audacity of the price ($178) on a hoodie that is primarily polyester and in which the inside is so fuzzy that it leaves white fuzz all over your clothing when you take it off. This to me has always been the sign of a cheap discount hoodie when you have to de lint yourself after wearing it. 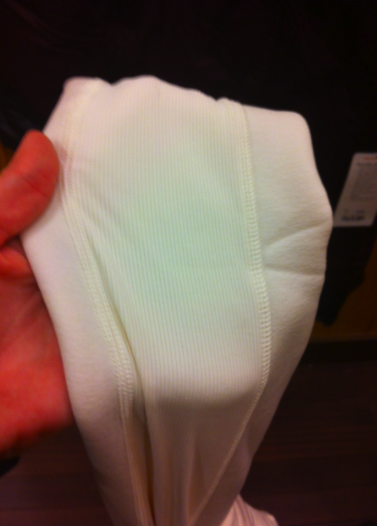 Stretchy and soft it definitely is but this is no where near the quality of the old cotton french terry scubas (the ones with the ribbed panels). I’d wager that the more recent scubas that feel ‘stretchy’ are actually not cotton french terry but blended with polyester as well. I’ll have to have a look at that when I go back. The outer material of this jacket has slight sheen to it so before checking this out in store I already suspected it would have polyester in it. ribbed luon panels on the arms. If you’ve owned a Stride Jacket or Dance Studio Jacket you know how prone to pulls this will be. 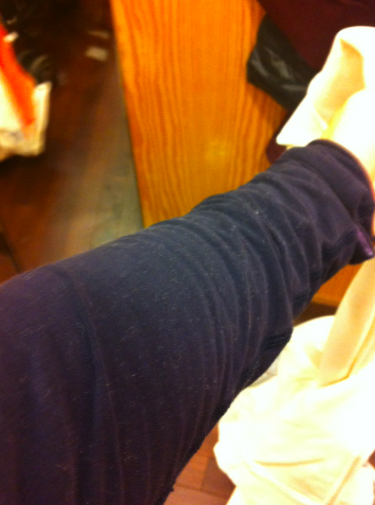 This is the lint on my arm after having brushed most of it off. 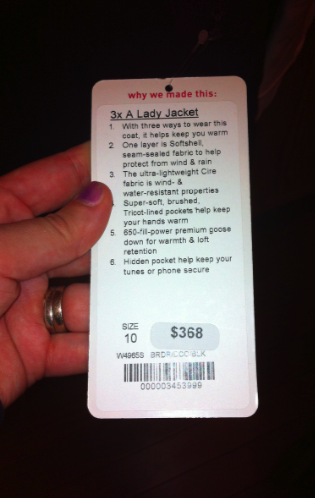 The inside fabric of the jacket. 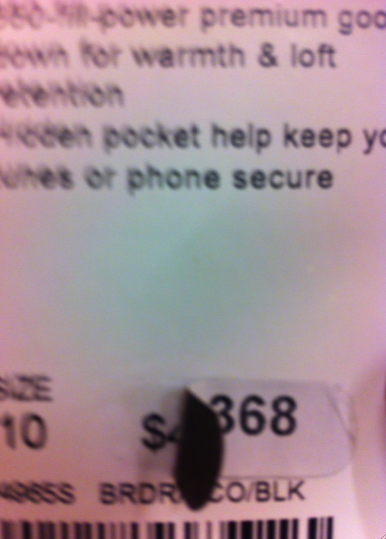 This jacket was originally priced at $4-something but they restickered it to $368. 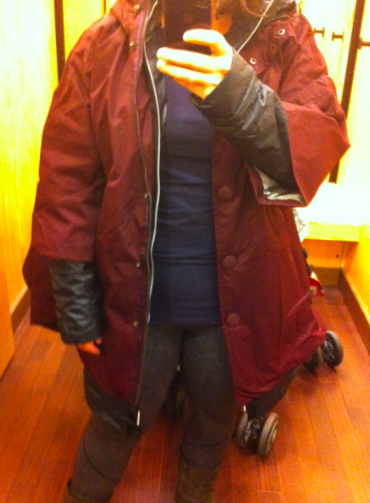 Right off the bat, this is way more jacket than I will ever need in Vancouver. Ever. Unless the Apocalypse is coming. It’s warm indeed so if you live in Saskatoon it will be practical. The cut however is really awful on me. It is bulky and wide and shapeless and the arms are also quite wide. 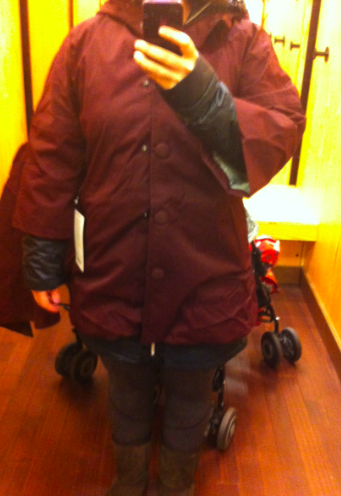 Except the inner down liner which is snug on me. So weird. 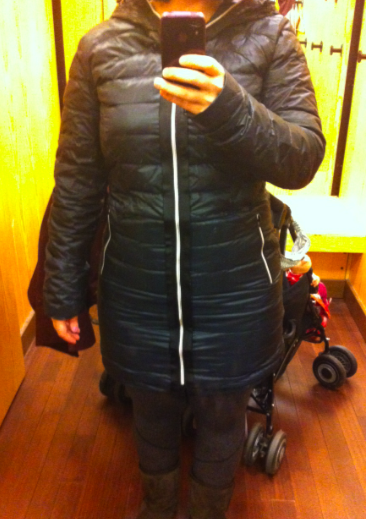 The outer jacket was quite big on me but the inner jacket was snug around my hips and tight over my Cabin LS. So I’m not really sure how to suggest sizing this. Probalby TTS if you are not as hippy as me…but if you are and you size up the outer jacket will be huge – so the only option is to stay TTS and deal with the snugness of the inner down liner. 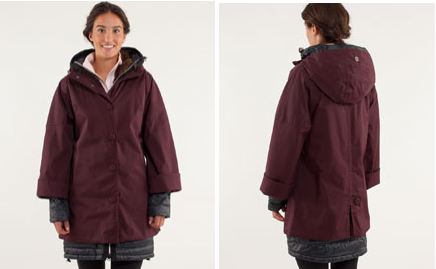 You can wear this jacket three ways, outer liner by itself, inner liner by itself or with the two zipped together. The wide A-Line sleeves paired with the wide A-Line Jacket just isn’t a flattering cut on me. See how snug the inner liner is by comparison? 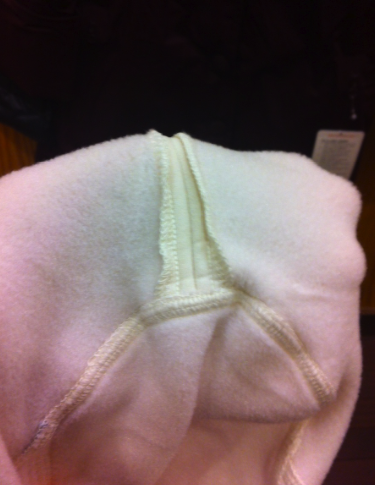 From my high waist down this inner liner was snug.